On a morning, much like any other morning, before I headed out for the day, I was checking my outfit in the mirror (fortunately it wasn't the soul destroying work mirror that shows every line and crinkle) and I thought "I'm looking pretty good for someone my age". Bang! 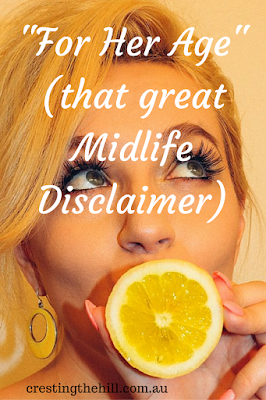 there is was.....the dreaded midlife disclaimer "for my age". How had it crept into my own mental dialogue without me even thinking about it? I'm not sure when in life it sets in that judgments are based on how old someone is....Does it start at 40? or 50? I can't imagine it applying to someone in their 30's. I've noticed I often do it when I see someone around my age looking good, and I hear it from others regularly too. I know for certain that no-one says about a 20 year old "gee she's looking good for her age" or "she's in great shape for her age", but when it comes to life after a certain date you become either invisible or "good for your age". Helen Mirren, the actress, has it attached to descriptions of her outfits all the time - particularly that shot of her taken in a red bikini (mind you she never had children so her tummy didn't suffer the indignities of being stretched to the size of a small town and deflated again numerous times - so that helps a bikini photo no end). I noticed another pic of her in a purple swimsuit and she looks much more like a woman in her second half of life - still pretty "good for her age" though! I've also heard people apply it in the negative too - "really, you wouldn't think she'd be wearing those earrings at her age" or "you'd think she'd be a little more settled at her age" etc etc. There must be a magic age where this disclaimer becomes normal and I'm yet to figure out when that actually is......maybe it's 42 (the answer to the universe's question). At some stage I'll have to start surveying a spectrum of friends and see whether they hear it or not to determine an approximate start date. I can't imagine it applying to the 30 something young mum down the street so it must be a later stage and I'm thinking somewhere between forty and fifty? So, do we fight the disclaimer? Or take it on board as a compliment? Or as a gentle reminder - in case we've had the audacity to forget how we should be behaving at that 'certain age'? Surely it has to be better than being invisible (the other curse of the midlife woman) because at least people have seen you to be able to pass comment on your appearance or behaviour. But it is still another nail in the coffin of middle age when your outfit choice is subject to a disclaimer even when you know you're looking pretty darn fantastic "for your age". I've chosen to kick myself in the pants if I catch myself thinking that way. I love all the pictures of much older women rocking bright colours, or bohemian dresses, or high heels, or whatever - so why put any disclaimers onto my own choice of outfits. I think from now on I'm just going to cut the thought off half way through and then it'll be "I'm looking pretty darn good!" end of story - no disclaimers! Love this because it is oh so true! 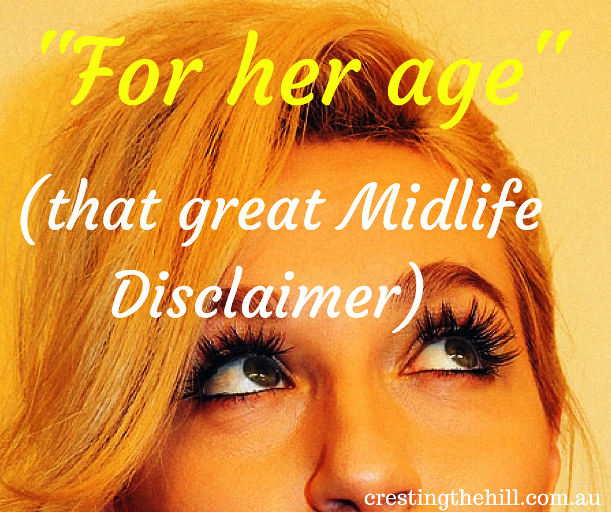 My husband says "I look good for my age" all the time and thinks it is a compliment. 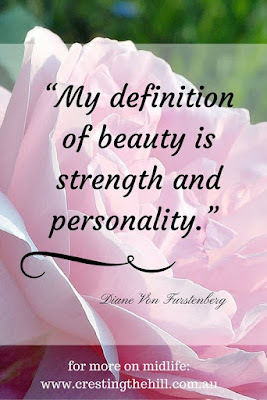 I always reply "what is a woman my age supposed to look like? A dowdy grandma"? Yes I'm with you. I think we should embrace our age and wear whatever we like, act disgracefully and get out there and see and do everything in the world. I'm not giving up yet!! I'm going down kicking and screaming Kathy - middle age is not what it used to be (thank goodness) so we don't need to add disclaimers - we can just celebrate and appreciate not being dowdy! Longer I'm on this earth – – you know :-) as opposed to the older I get :-) – – the more I'm seeing in my friendship groups the fact fat talk has shifted into old talk. I'm sure this isn't true across the board, but instead of setting ourselves free from worrying about a few extra pounds and measuring ourselves up against the latest Victoria's Secret model :-) it seems friends have let that go but transitioned into focusing on old. How old someone looks. How they look for their age. All of it. This old broad :-) is ready to let all of that go. Me too Carla - it's crazy trying to compare ourselves with the 20 somethings who haven't lived our lives. I think the beauty of midlife is seeing the kindness and happiness shine through - and when that happens, nobody notices a few extra pounds! I've never thought about this. I'll have to pay more attention to my self talk when I'm looking in the mirror. Leanne, I'm guilty of this phrase myself. I recently saw a picture of Tina Turner and I believe she's in her 70's and she looks great for her age. Hehe It's hard to not sneak that last part in. You make some good points here and what is that magic age to insert the disclaimer? Honestly, I think the next generation will find "that age" to be a little higher. The view of age will be a little different as we progress. I always thought people over thirty were "old" Laurie - it's funny how the line changes each decade! We're certainly not our grandmothers and I'm not going to apologize to anyone for not being "my age!" It's amazing how many ways we qualify what we say with disclaimers. What a good reminder this is. Didn't even realize I say this until I read your post. Yikes! I say it all the time. Hmmm . . . going to have to reboot . . . I am pretty guilty of saying stuff like this. I need to stop. Especially when I'm saying it about myself. 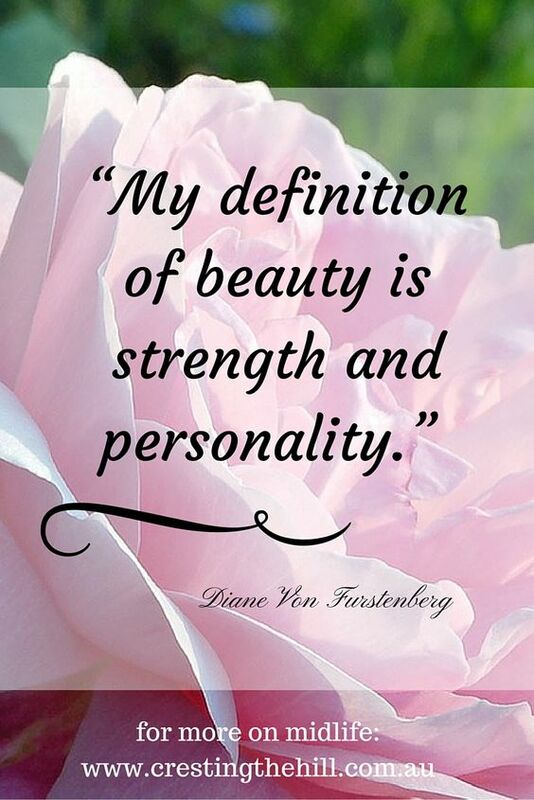 I think we need to learn to look at ourselves with a bit of kindness and give ourselves a pat on the back more Doreen - and lose the little "proviso" we tack on the end. I don't know if it's something we can stop. When you look in the mirror and see your mother it's a part of life. Besides, the wrinkles and chin hairs give you character. OK, not exactly the character I had in mind, but, oh well. It scares me a bit to see my mum in the mirror (altho she's a very attractive woman and I wish I had a few more of her physical traits!) but I think it's nice to just look at ourselves all scrubbed up and shiny and go "you look amazing girl!" I say that to make myself feel better - to remind myself that it's OK that I don't look 25. Maybe it's not such a good idea. I sometimes say that but in a positive way Leanne. I feel I'm pretty darned good for my age. At nearly 60 I'm healthy, fit and actually never looked better. I'm happy with who I am FINALLY! You are a pretty "sizzling" woman Sue - and such an inspiration to me as well. I think we're actually coming into who we really are and that reflects back from the mirror. We don't need to justify it - just enjoy it! I don't like any disclaimers! You make a good point though. I'm afraid I find disclaimers a little self defeating - I'd rather hold onto the original thought and not add an apology at the end. I think it's part of my search for authenticity. The language we use can be used positively or negatively. "At your age" is still a colloquialism that we find ourselves saying because it's what we know. Great post,Leanne, and thanks for bringing it to our attention! I stopped in from the Blogger's Pit Stop and am so glad I did! I am 47 and I am definitely aware of my age. Especially in the fact that they don't make clothes I would choose for myself because I am a "mature" woman or mid-lifer. Um, just cuz I've got a bigger number does not mean that my taste has dramatically changed or disappeared entirely, thank you very much! I cannot help you in nailing down when this turn takes place other than to say for me it was sometime in my 40s... I don't even remember when. Loved the post and will be sharing it on Pinterest. Have a great day! Is it day there in Australia? It is nighttime here as I write this. Hi and I'm so glad you stopped by! I read an article by a 30 something who was bemoaning being told she looked "young" so I guess every decade has a disclaimer after all! It's late afternoon in Australia and a lovely Spring day - really hot tomorrow so Summer is on its way at last - hooray! Awesome post Leanne, you nailed it again. I wish we would stop quoting our age, forget age and just go for life. Love every birthday and be thankful but leave the numbers off, we don't need them. Thinking about numbers is just like you are talking about, it is a little subliminal constant reminder that says your getting old. It works against our energetic outlook. I couldn't agree more Kathleen - especially when it works against a positive mindset and appreciating the age and stage we're at. This is a great reminder Leanne and goes well with my recent post about accepting and giving compliments. No disclaimers are required. Thanks for sharing as I don’t think I was aware of your blog back then.